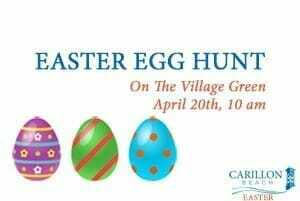 Please join us on our Village Green for our Annual Easter Egg Hunt! Bring your kids and your smiles for this fun event. There just might be a very special guest… but who knows??!!?? The event is from 10 am until noon on Saturday, April 20th. Kids – have your baskets in hand! Homeowners, please make your plans now for the Annual Meeting & Homeowners Weekend May 31st – June 1st. The events will kick off with our Town Hall on Friday night and conclude with one awesome event at our Beach Club Pool. You will not want to miss it! To future homeowners – we look forward to meeting you! 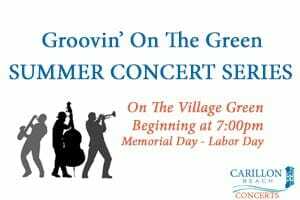 Please join us on our Village Green for our GROOVIN’ ON THE GREEN summer concert series. This is our most popular event series and we are excited to present the lineup for this summer! Bring your family, chairs, blankets, food, and drink to our Village Green and don’t be surprised if you feel the need to dance, sing, or sway! Time: 7:00 pm-9:00 pm. Our local restaurants will be open. Be sure to follow our Facebook page for special updates. Continue to check this page for event updates, including our 4th of July Parade, and Holiday Tree Lighting & Parade! STAY TUNED!